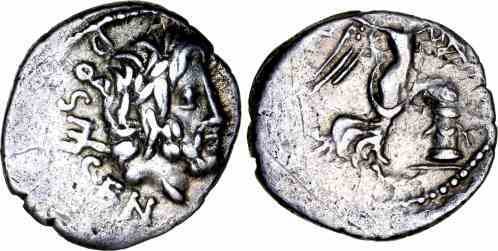 Silver quinarius, 15mm, 1.52gm, issued 87 BC. Rome mint. Obv: DOSSEN, Laureate head of Neptune right, trident behind. Rev: Victory walking right holding wreath and palm, snake entwined altar before. References: Sear 261, Cr 348/4. The snake entwined altar may have been an allusion to Aesculapius, the god of healing, as a plague broke out that year.